It lies only within the gift of an artist to see what others cannot and to crystallise that vision in an image so clear that the detail is forgotten. We all have these flashes, visions and insights, which come at the oddest times, frozen in memory that few of us have the power to express. Photography, really good photography, sometimes jumps the hurdles our minds put in the way and drills to heart of the matter – a picture of a napalmed Vietnamese child comes to mind, an unforgettable image of a small tragedy that was to play a powerful role in stopping a war and earn the man who took it, Nick Ut, a Pullitzer prize. But for all its immediacy, photography has only a fraction of the power of art when it comes to linking the seen, the half-seen and the imagined together. Air & Water does exactly that. We don’t see very many books of angling art because it has never been a particularly fashionable subject, but as Colin See-Paynton demonstrates, a fisherman’s eye passes over more beauty in an hour than the average person will in a lifetime. In what is probably the most attractive volume Medlar has ever produced, we are treated to twenty three years of Colin’s engravings, interleaved with text from some of our most famous angling writers. 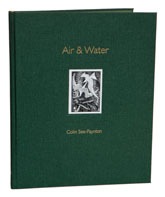 Despite featuring authors like Farson and Ransome, Air & Water repeatedly proves that a picture can be worth much more than words, with engravings so good that the eye is drawn back to them again and again. My favourite is Colin’s most ambitious work, ‘Sudden Movement’, which captures an explosion of mallard off a water hiding the shadow of a pike. So many times I have watched driven duck make that same leap into the air and so many times have I watched the flank of a pike lunging in a turn – but no-one has ever paired the images and turned them into something like this. If you need any more encouragement to buy Air & Water, which should sell out in nothing flat if there is any justice in this world, the paper has the most superb smell, which should mature into something quite special in twenty years like fine wine.